My name is Donald Miskel. I am a 62 Y.O. martial artist, minister and pastor. 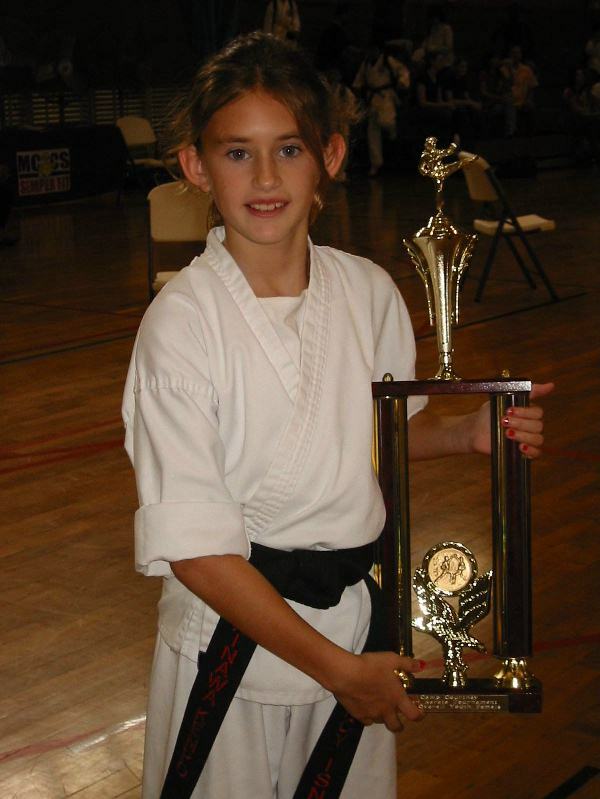 I've been involved in the martial arts for 50+ years. I've thoroughly enjoyed your webpage and the in depth history you present. I hold advanced rank in Gojute Kempo, Shorei Goju Karate and Jute Ryu Aikijitsu. I am the Shodai Soke of the Black Lotus Martial Arts Association. I am fortunate enough to own a set of your DVDs and have found them educational and informative. I appreciate your efforts and your contributions to the martial arts. God bless you in your future endeavors. You can also WATCH (with a subscription) or BUY/DOWNLOAD our Video's ONLINE!!! Pay by check or credit card through PayPal! To ensure your order is quickly processed, Please us and let us know you placed an order. Some say that traditional martial arts skills are not sufficient for the mean streets of today's changing world. True training of martial arts mastery is rarely seen and often misunderstood and sometimes even exaggerated. Some of the world's deadliest martial artists and fists of legend began with drills and skills that emphasize form, style balance, speed, control and extreme discipline. This is not the formula for brute strength or street fighting. It is the formula for deadly and disciplined skill in the art of life protection. Vol. 1 DeValentino sensei demonstrates the evolutionary blend of Chinese, Okinawan and Japanese origins. Particularly Chuan Fa, Shuri Te, Naha Te and Tomari Te that make up the joint locking-nerve striking Power of OKINAWA KENPO. Assisting in self defense, armed, unarmed and multiple attack applications are DSSI Black Belts Kevin Roberts, Jeremy Rolain, and Michael Quezada. 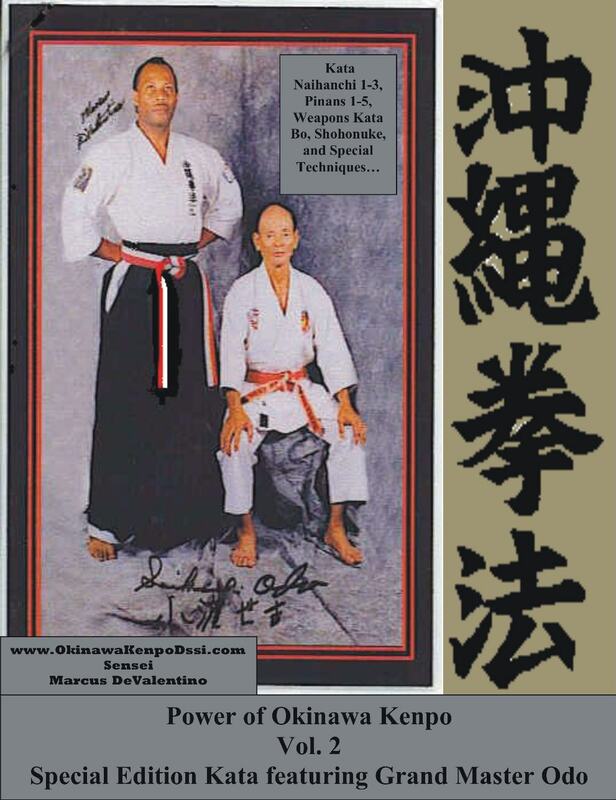 In 1997 Marcus Devalentino was appointed by his sensei, Grand Master Seikichi Odo as technical advisor of his Ryukyu Hon Kenpo Kobujutsu Federation (Okinawa Kenpo) Okinawa, Japan. Due to changes in organizational structure and the untimely passing of Odo sensei, he and Marcus jointly completed only the first of what was to be many official instructional videos. "THIS IS THAT RARE VIDEO". Here Marcus performs kata with karate spirit. Next Grand Master, Seikichi Odo flawlessly performs the kata. Assisting Marcus in kata bunaki applications are DSSI Black Belts Kevin Roberts and Jeremy Rolain. Vol. 2 covers the following Okinawa Kenpo kata Kata: Naihanchi Shodan, Nidan, & Sandan, Pinan Shodan, Nidan, Sandan, Yondan & Godan plus the powerful bo form Shihonuke. 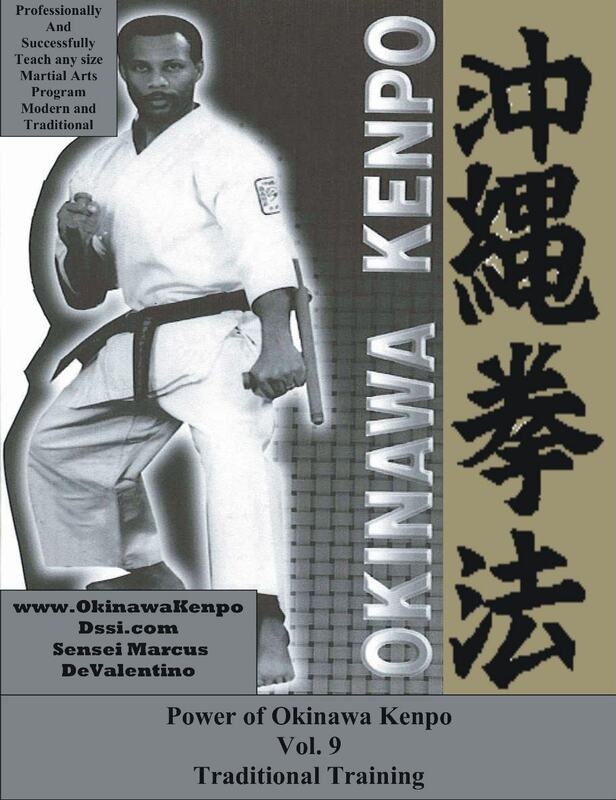 By 1997, as a licensed instructor under Grand Master Seikichi Odo of Okinawa Japan, Marcus DeValentino had become consecutive State and National champion of martial arts forms, weapons, fighting, and showmanship, producer of a 7-year Hawaii martial arts television program, and director of 15 Okinawa Kenpo Karate Kobudo schools, DEVALENTINO SHUDOKAN SCHOOLS INTERNATIONAL DSSI. Vol. 3 covers the DSSI's curriculum of Okinawa Kenpo kata, kobudo, and life protection requirements for advancement from White Belt to Green Belt. DSSI Black Belt assistant is Edwin "Skip" Vincent. Kata: Naihanchi Shodan, Nidan & Sandan, Pinan Shodan, Nidan, Sandan, & Yodan. Kobudo: Kihon bo 1, 2, 3, DeValentino bo, Shihonuka, Choun no Kun, Suiyoshi Nokun Ichi, Suiyoshi No Kun Ni, and Odo no Tonfa Ichi. Vol. 4 covers the DSSI's curriculum of Okinawa Kenpo kata, kobudo, and life protection requirements for advancement from Brown Belt to Black Belt-Master Level. DSSI Black Belt assistant is Edwin "Skip" Vincent. Kata: Pinan 5, Wansu, Niseishi, Ananku, DeValentino kata, Seisan, Hakutsuru Ichi, Gojushiho Ni, Passai, Chinto, and Kusanku. Kobudo: Odo No Tunfa Ni, Kyan No Sai, Shima Igiri Bo Ichi, Odo no Nunchaku, Nakumura No Sai, Odo No Sai Ichi, Odo No Sai Ni, Tsukan Akachuno Eku Bo, Shima Igiri Bo Ni, Tokumine Nokun Ichi, Sakugawa Nokun Ichi, Sakuqawa Nokun Ni, and Odo No Kama Ni. Kobudo refers to the ancient weapon arts of Okinawa and Japan. Today, Okinawan kobudo survives mainly through its practice in karate schools like DeValentino Shudokan Schools International (DSSI). This SPECIAL EDITION video was filmed in VHS live at Master Rich Pelletier's dojo, Pelletier's Karate Academy, a DSSI school located in Lewiston, Maine. Kyan No Sai, Odo No Sai, Odo No Tunfa Ichi & Ni, Choun No Kun, Odo No Nunchaku, and Shima Igiri Bo ichi. This video is designed by Marcus DeValentino, National Champion and formerly a direct student of Grand Master Seikichi Odo as a powerful reference tool with the Okinawa Kenpo expert and martial arts expert in mind. No supplements, just a straight through cut of required kata (basic forms, 3 naihanchi, 5 pinans, wansu, ananku, seisan, gojushiho ni, niseishi, passai, chinto, and kusanku) plus weapons kata (including bo, sai, tonfa, nunchaku, kama sickles, and eku bo) which are performed with power and speed and with awesome background music as always. A special section of Bunkai analysis is also featured which is not available in previous volumes. Great for quick reference or serious study. The art of kobudo (ancient weapons art) is actually a stand alone art that compliments the empty hand martial arts. The late Grand Master Seikichi Odo incorporated his knowledge and experience of kobudo into the Okinawa Kenpo system and promoted both Okinawa Kenpo and Kobudo as a complete system of his Shudokan organization headquartered in Gushikawa City, Okinawa Japan. This instructional video references the following kobudo kata: Kihon bo ichi, ni, and sanbon, and DeValentino bo as fundamentals. Shiho Nuke, Choun no kun, Suiyoshi Nokun Ich and Ni, Odo No Tunfa Ichi and Ni, Kyan No Sai, Nakamura No Sai, Odo No Sai Ichi and Ni, Shima Igiri Bo Ichi and Ni, Odo no Kama Ni, Odo no Nunchaku, Tokumine No Kun Ichi, Sakugawa No Kun Ichi and Ni. Martial Arts were also developed to enable us to overcome larger-stronger opponents. Since traditional karate was once a secret, the kata or forms hold the blue print for hidden applications that teach tuite and kyusho or, joint and nerve manipulation techniques that basically require only a third of our strength to be effective. Many martial artists today are for the first time discovering the secrets of pressure points skills hidden in the roots of the martial arts which was once a secret. This special edition video was filmed live in VHS as a seminar on Oahu Hawaii at the Waianae School of Self Defense. Enjoy this great reference tool as the real live reactions from the children lightheartedly amuse you. These techniques should only be practiced under expert supervision. This video reveals the answer to that common question, "How does an instructor effectively, successfully, and professionally teach a large class of martial arts students of various ages and in two languages. It captures live footage with a narrative as sensei Marcus DeValentino takes you through his hard charging, highly disciplined, and motivated training session at his Hawaii based world headquarters. This includes the line up, the calisthenics, the basic kihon drills, the kata review, the weapons kata review, the self defense review, tameshiwara power breaking, and the formal closing plus, bonus footage of sensei DeValentino promoting the former Mayor Jeremy Harris of Honolulu, Hawaii to the rank of Black Belt as witnessed and honored by the Hawaii Karate All Stars Team. These concepts can be applied to just about any fitness and discipline oriented martial arts system traditional, or modern and one can see how TRADITIONAL TRAINING has also helped DeValentino Shudokan Schools to develop so many champions and legendary students. or liability which might occur regarding the use or misuse of our products.